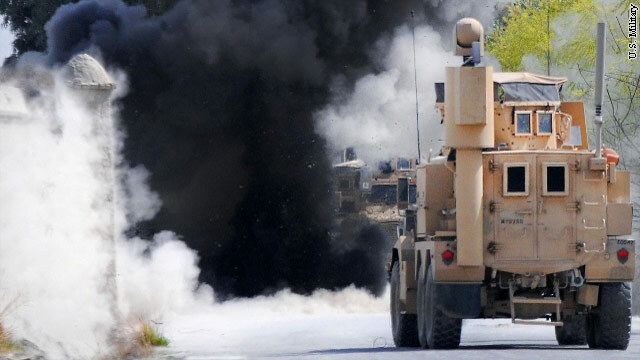 Army staff at the Pentagon are denying or delaying some requests for a preferred anti-roadside-bomb system preferred by Army combat units deploying to restive regions of Afghanistan, according to internal Army documents obtained exclusively by CNN's Security Clearance. Improvised explosive devices (IEDs) continue to be a leading killer of U.S. troops in Afghanistan, and the anti-IED program has been at the center of an ongoing controversy with the Army accused of denying troops a better - and less expensive - system developed by an outside company in favor of one developed in-house. According to the documents, the latest rebuff by Army staff was aimed at the 4th Brigade Combat Team (4th BCT) of the 1st Infantry Division, based in Fort Riley, Kansas. Earlier this year, as the unit of several thousand soldiers prepared to deploy to eastern Afghanistan in one of the most deadly regions in the country, commanders filed their first request for a computer intelligence software system called Palantir. The system tracks insurgents and predicts where they might place improvised explosive devices (IEDs). The Palantir technology was developed outside of the military procurement system; the software ties together intelligence data to improve information for troops about the possible location of roadside bombs planted by insurgents. But the Army has been using its own technology in Afghanistan, the Distributed Common Ground System (DCGS), which many soldiers believe to be inferior to Palantir when it comes to hunting IED’s. Army civilians at the Pentagon seem resistant to allowing units to change systems when requests come in. Earlier this year, the Army conducted a survey of soldiers who have used the system and found a widespread belief that the Palantir system is a better resource than the homegrown, Army-wide DCGS software. The 4th BCT request was turned down and, soon after, the unit deployed with the DCGS. The move by the Army on the 4th BCT adds to the growing list of denials or delays it has made to deploying or deployed units, according to Army documents and e-mails seen by Security Clearance. In the case of the 4th BCT's primary request, commanders from the unit - while still at their post at FortRiley - filed a request for the Palantir system to the Army's Rapid Equipping Force, which meets urgent needs for deploying Army units. CNN's Security Clearance agreed not to reveal the names of the soldiers because of privacy concerns. "Palantir will provide the capability to reach across numerous data sources and systems to quickly fuse intelligence to maintain situational awareness in a quickly evolving operational environment. ... We feel this system will aid the 4th BCT ... to make sound and timely decisions," according to a request by a mid-level officer in the unit to the Army's Rapid Equipping Force. In response, the Army denied the request on the same day. "I cannot buy Palantir anymore without involving the Senior Leadership of the Army, and they are very resistant," according to an e-mail response to the officer in the 4th BCT from a senior Army officer in the Rapid Equipping Force office. The Army has said it is using Palantir in the field in limited quantities. It is also testing the system and how it integrates into DCGS. Results from those tests have yet to be released. Last month, in a written response to Rep. Duncan Hunter, R-California, about the status of the Army's procurement of the Palantir system, Secretary of the Army John McHugh said, "I and the entire Army senior leadership take these issues very seriously and have taken steps to thoroughly examine the acquisition, testing and distribution of these systems," according to the letter obtained by Security Clearance. "From the time the Army's first conventional ground force requested the software in 2008, there have been deliberate efforts on the part of mid-level bureaucrats to deny units this resource despite repeated urgent requests from commanders," Hunter said in his original letter to McHugh, sent in August. Hunter, an Iraq and Afghanistan war veteran, has been at the forefront of this flap, calling on the Army to explain delays in getting the Palantir system into the field as soon as possible. Major Army divisions or elements of divisions that have been blocked or stymied from using the software system in Afghanistan include the 101st Airborne, 82nd Airborne, and the 3rd and 2nd Infantry divisions, according to sources with knowledge of the request denials and delays. But Army officials maintain that some Army units are using the system in the field and some denied requests were for common sense reasons. “Some units requested Palantir and were rejected because they were replacing a unit that was handing its Palantir system over to them, so if there was seven more months on the contract it would not be cost effective to buy a new one,” said Lt. Col. Freddie Mack, and Army spokesman. "With IEDs still the main source of casualties, there is absolutely no justification for these delays," Hunter said in an e-mail statement to Security Clearance. "We continue to learn about unit after unit being denied alternative counter IED resources with wide use and effectiveness by other services and commands. The Army seems content with making things difficult for all the wrong reasons," Hunter continued. The 4th BCT deployed throughout the late spring to eastern Afghanistan. The unit was based along the border with Pakistan, in Pakitika province, known to be an insurgent hotbed. In August, from the field, the 4th BCT's commander, a colonel, filed an urgent request to the Army Headquarters at the Pentagon to again try to get the Palantir system for his troops. "The threat from a reduced operational presence in boundary provinces and districts grows," the colonel wrote the Army staff. "With the upcoming expansion of the (unit's) operating environment to encompass the most kinetic province in Regional Command East, the Task Force ... requires an immediate capability to analyze ever greater amounts of data," the colonel said in the memo. In the memo the colonel explained that the unit, which his replaced in Pakitika, had used Palantir with success, and not using the software system caused an unnecessary risk to troops." "Disapproval of the Palantir platform will be detrimental to counter-IED analysis and operations," he said in the memo. Army spokesman Col. Jonathan Withington told Security Clearance Wednesday night the 4th BCT had been approved to receive Palantir after the initial denial earlier in the year. He did not know when the approval had cleared the chain of command at the Pentagon. Withington could also not say how long the acquisition process would take in order to deliver the Palantir software to the 4th BCT. “I just don’t know how long the acquisition process takes for this,” Withington said. The unit is on a nine-month deployment, which means some troops could be returning back to the United States by February 2013 or earlier. A similar Palantir request by a unit in the 2nd Infantry Division in 2009 also was denied initially prior to deployment, but the Army eventually approved the request after multiple requests from the unit while it was in the field. However, bureaucratic delays slowed delivery, and the system was received in Afghanistan just two months before the unit was to return home, according to a staffer familiar with the issue in Hunter's office. The delay did not allow for training on the system or enough time to plug in information to make its matrix useful to identify potential IED sites, according to the staffer in Hunter's office. According to CNN records, at least four soldiers from the 4th BCT have been killed since arriving in Afghanistan in June, two by IEDs. Security Clearance has reported extensively on the bureaucratic flap between Army civilians and soldiers in the field requesting the software over the DCGS. In an August report about a memo from the head of the Army's test and evaluation command, Gen. Genaro J. Dellarocco, to Chief of Staff of the Army Gen. Raymond Odierno hammered the DCGS for its "poor reliability" and "significant limitations" during operational testing and evaluation earlier this year. Security Clearance also reported that earlier this year, after ordering the Palantir system pushed out to units in Afghanistan that had been urgently asking for it, Odierno requested that the Army's operational test command report on the software system by surveying troops who have used it. Documents obtained by Security Clearance show that the initial report came back with overwhelmingly positive feedback on Palantir and recommended that more computer servers be put into Afghanistan so more units could use the system. But despite the findings, the commander of the test command, Col. Joseph M. Martin, reportedly ordered the report destroyed and another report generated that removed favorable references to Palantir. An Army investigation is still ongoing into that incident. The Army has spent over $2.3 billion in procurement and research and development to fund the DCGS. The Palantir system requested by U.S. troops is about $2 million, according to congressional staff familiar with the programs. This series of articles by CNN is bunk. Yes, there's a Congressman in the pocket of Palantir. Corruption in Congress, big surprise. Yes soldiers love it, because it's simple and easy. But it doesn't have any magic that makes it better, only simpler and less comprehensive. And CNN would know that, if they had done any first-hand research instead of just getting sent copies of memos and being cronies to political agendas. What happened to journalists researching before they reported on something? You can open up the Palantir program from a web browser, even if you don't have the program installed. I tested it out at work. There might be some cost to getting accounts, but obtaining the program shouldn't be that hard if you are on the SIPRNet. Just another example of how nobody gives a damn about us out here. What? Give our troops something that works? This is not the mentality at the Pentagon! The Pentagon only cares about their favored contractors. It happens over and over again. Our soldiers in Vietnam were given new rifles that didn't work, the Osprey program was a disaster. Our troops were sent into Iraq with humvees with no armour plating. Contractors were hired to support our troops, some built showers that electrocuted our own soldiers. The list goes on and on. Even Backhawk still operates today under another name after failing to perform! toes to protect our troops, or pretend you are the soldier and you need this. You only get one chance. The Pentagon needs to be reorganized yesterday! As a Veteran of OIF This story kind of angers me... When we sign up for duty, we understand that we will fight for our country and we could potentially die for our country. This is a fact all Soldiers come to peace with, however, there's also a trust placed in those who outfit and supply us that they will do whatever they can to get us the best possible equipment with of course respect to the cost to the taxpayer. In this instance according to the article at least... We're seeing a situation where not only is a better system available, but also a cheaper alternative, and those Civilian desk jockey's at the Pentagon appear resistent to providing it, because they've already spent too much money on a system that is inferior to this product... Now we're in a situation where due to some injured pride from some desk jockey in the Pentagon, troops on the ground are not getting the best equipment even when it is the cheaper alternative. This is outrageous in my viewpoint. This is uncalled for. These situations need to be rooted out and the folks responsible need to be held accountable. People should lose their jobs over this. This story is just the tip of the iceberg of the corruption, incompetence and waste in Defense development and acquisition. These people talk a good game about dedication to serving the warrior, but they're really just there to serve themselves and collect a big fat paycheck in the process.